Today I was introduced to Georges at Piccadilly in Sydney CBD by my family auditor (called George). One doesn’t get taken out to lunch by an accountant often, so I was curious to see where an accountant eats. Georges sits on the ground floor of a shopping centre, doing brisk business with silver-haired patrons. The hearty traditional menu is similar to the menu at Cosmopolitan Cafe in Double Bay I was told and they used to belong to the same owner. (FYI, Cosmopolitan is a rather posh cafe for the Double Bay set to rub shoulders when I was still at school, ‘whoever was anybody’ dines there). Owner Leo, ever hard-working was on his feet making sure everything is in order. Georges menu are traditional casual lunchtime fares consisting of sandwiches, melts, salads, steaks and seafood. Sandwiches and toasties are popular for the older ladies whereas the gentlemen preferred their heartier steaks or huge plates of fish and chips to go with a glass of vino. I ordered Moussaka with a side salad. It was huge slab of minced meat and eggplants sandwiched between a potato base and the creamiest, thickest layer of belchamel cheese. It was slightly spiced, however leaning to sweet which I assume to cater for the older tastebuds. It was lovely nonetheless. With the temperature taking a sudden nose-dive today, the pipping hot moussaka was moreish, I guiltily finished it all. Coffee, though was a tad weak and very milky to cater for its set of clientele. At the time of review, Georges Cafe Piccadilly scored 55% out of 9 votes! 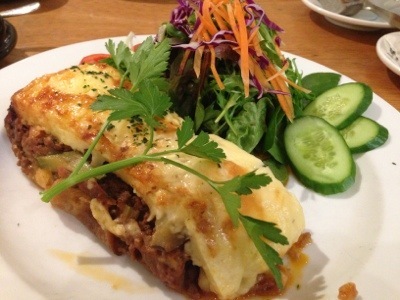 This entry was posted in Cafe, Sydney and tagged Greek Food, Mall Dining, Moussaka. Bookmark the permalink. I had my lunch in Melur & Thyme on the 23rd of September 2013 and asked the waitress who attended to me if the Deep Sea Aglio Olio had a vegetarian option, and she said yes, hence I placed my order for a vegetarian Aglio Olio. The Vegetarian Aglio Olio came with a little bit of broccoli, cauliflower, green and red peppers, carrots and some snow peas. When I called for the bill, I was still charged the same price for the Deep Sea Aglio Olio, when I asked the staff in attending about the price difference, she mumbled something about everything being at the same price. This is totally unacceptable, as the staff should have mentioned that or it should have been written in the menu that or she could have just said that there will not be a price difference, or EASILY SHE COULD HAVE SAID NO when I asked. I have eaten in other restaurants in KLCC and they all practice that if the dish is a purely vegetarian dish, then it would be priced slightly lesser, otherwise I would have just gone with the original dish with seafood. This is really disappointing and when I asked the staff if they have a customer feedback form, they just ignored me and walked off. Customer Feedback Form should be mandatory in any service providing business especially in F&B. This is not how you treat your customers, especially in a well established place like KLCC and I think proper training on how to answer simple questions should be given to their staff. It does not hurt to be polite to customers. While I agree with you totally, that the restaurant should have adjusted the price when they said that there is a vegetarian option, however it is up to the restaurant whether they charge less. Next time, ask them whether there is a price difference, if not, any additional vegetables. You are not the only one who complained about the service there, I’ve read a few reviews from disgruntled customer-bloggers too. Cheers!